One day last year, I sat down and wracked my brain to come up with a ranking of my favorite films of all time. 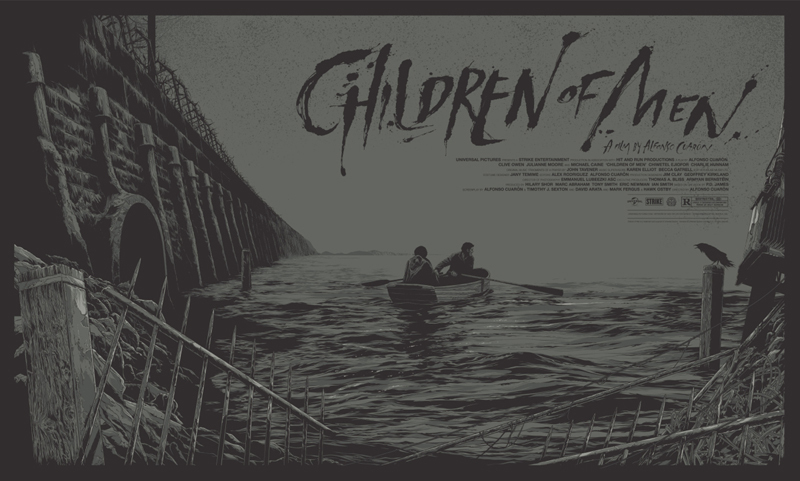 After much deliberation, I determined my top film ever is Children of Men, the dystopic masterpiece from director Alfonso Cuarón, released on Christmas Day 2005. I can remember seeing it for the first time. I was in San Diego visiting my brother and his wife. We all went to see it together. When it was over, I felt stuck to the chair, unable to move. The emotional impact of the film felt like a spear had impaled me, pierced my chest and nailed me to the theater seat in wide-eyed shock. It was an experience I'll never forget. Despite the premise being a distant future---the year 2027 in which humans have lost the ability to reproduce leading to anarchy and rampant terrorism all around the world---everything about the film felt relevant to the current moment. I can remember being viscerally stunned at the force of the filmmaker's message, it felt like a desperate plea, trying to re-awaken our sense of humanity through art. Now, a little more than 10 years later, this sci-fi dystopian display of theatrical imagination feels more realistic than ever, loaded with xenophobic nationalistic politics conveyed through news media, ever present armored police militants, and extreme anti-immigrant, anti-refugee policies leading to frequent terrorist attacks. Lately Children of Men, which was a box office flop when first released, has been gaining more and more attention due to its sudden allegorical relevance in our alarming contemporary situation. Abraham Reisman of Vulture recently summoned director Alfonso Cuarón to discuss the film as framed in the context of Brexit, the Trumpacolypse, etc, leading to an in-depth feature piece entitled "Future Shock" positing that Children of Men "might be the most relevant film of 2016." He recruited his longtime friend and frequent partner Emmanuel “Chivo” Lubezki to be his cinematographer. Together, they hit on the idea of loading up the background with information — graffiti, placards, newscasts — and thus limiting the kind of expository dialogue that often plagues dystopian stories. Cuarón recalls Lubezki declaring, “We cannot allow one single frame of this film to go without a comment on the state of things." Following the feature, Vulture also published an expanded interview with Cuarón where they go into more detailed depth on the making of the film, what he felt it was really about ("it was more about spiritual infertility"), and the filmmaker's enduring hope for the future. To the excellent observation that the shot of pregnant Kee in the barn echoes the posture of Botticelli's Venus, I want to add that the scene is also literally overflowing with symbols. Kee, the key symbol of the film, the future of the human race in the form of a young pregnant mother from Africa, stands surrounded by cattle, symbols of fertility from time immemorial, with their mother's milk being extracted. Fertility, fecundity, pregnancy are the story's most important symbols. Note the year is 2027, and it's been 18 years since the last child birth. 27 and 18 are both divisible by 9, the number of gestation. I could go on forever about this movie. Here's hoping we as humanity get through our current bleakness and continue to produce beautiful art like Children of Men.